swissmiss | Oh Darkroom, I miss you. Oh Darkroom, I miss you. Jon pointed me to this wonderful photo project showcasing London’s remaining professional darkrooms. Looking at the images I had flashbacks to the smell of all the chemicals. Oh darkroom, I miss you! I *love* the smell of the darkroom! I miss it, too! I have soo many great memories in the dark room! It´s a shame film photography is suffering a slow death. I really hope us enthusiasts keep it alive. Oh I still dream of being able to have a darkroom at home. I love the smells and tactile experience of the darkroom! I don’t know…I think my photos turned out better when I used film and developed them myself. Perhaps because I was more careful about composing them? I also miss being in the darkroom. There are only a few things in this world that I can do for 10 hours straight with no break, and printing in a darkroom is one of them. I learned photography on a Minolta SRT202, so I am still attached to film, even though I now shoot digital for reasons of cost. oh yes! I miss it too! 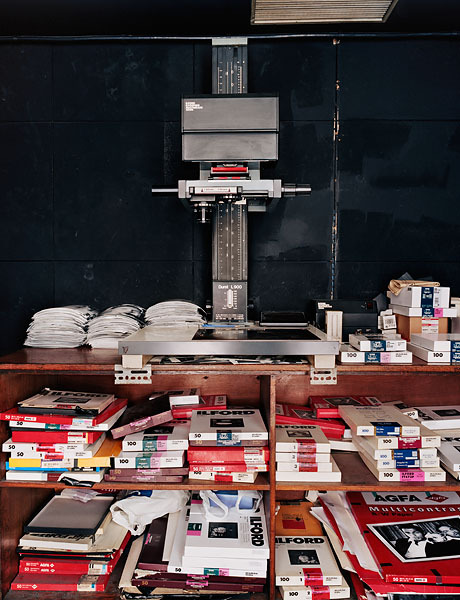 I grew up on the cusp, right when digital was coming in, but I so miss the darkroom! It’s such a different art form than photoshop. I used to wonder if digital and analog photography should even share the same name. Those stacks of Ilford boxes immediately bring me back. I remember having the smell of developer on my hands all the time in University. Good times indeed! The ritual tasks of cutting in the dark, sliding paper into the easel. Dodging, waving hands through the projected beam of light like performing an incantation. The slow reveal of the latent image in the amber light. The moment of terror when you opened a box of paper with a light on. It’s funny how we all miss the fixer, chemical smell of the dark room. It’s an instant memory trigger when you see that photo. wow i haven’t thought about a darkroom for a long time. i has some exciting and nerve-wracking times in there. It’s not just the smell I miss, I miss quality film photography. Call me old school, but the flat quality of digital photography doesn’t do it to me. Just compare a photographer’s work before and after she/he picked up a digital camera. We have a DKRM in school, I spent a lot of time there, but I’d actually love to learn the real deal. Is there an old Pro in search of a successor? confession: i used to love it when my hands smelled like fixer. but i hate the smell of gasoline. The darkroom is not dead! Look in the rite place and youll find brilliant places of D-76, Stop, Fix, Hypo and Photo Flo!! A faculty member at The Emily Carr University in Vancouver, BC sent me Richard Nicholsons link some time ago. Sadly enough, the darkroom facilities at ECU may be among the last active B&W and Colour wet labs; which are favored by students and appear to be more frequentlly used over the schools digital facilities! Anyone in on a trip to Canada to check out the Photography Exhibition at this years Grad show?!?!? Here in Boston we still have several rental analog darkrooms! NESOP and MFA have gang dark rooms. LaPete labs in the fort point artists district has high end black & white equipment and affordable individual printing and processing rooms. Call us at 617-459-9209! Is this the Bill Lapete that I went to Don Bosco with about half a century ago. If so E-mail me and maybe we can meet somewhere in Boston. I am retired, so I have time on my hands, maybe not on my side. That’s me! I’m still in business in town at 369 Congress street, Boston, MA 02210. The phone is 617-459-9209. I just found this string today (november 6, 2013).